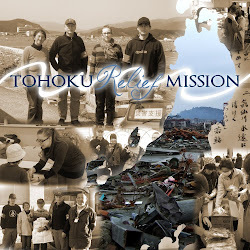 An associate of ours, Shimonaka, from Tamba city in southern Japan contacted us about a friend of his living near us who had 500 kgs of rice, along with other food items that he wanted to donate to the tsunami victims. We were able to pick up all the supplies, thanks to our friends Sean and Akira who came in their van to help us get it all to Noda. Thanks guys. Kasai san, a friend who works at the Matsudo Produce Market also donated a carload of fresh vegetables for us to take to Minami Sanrikucho in Miyagi Ken. On the evening of May 18th, we loaded the supplies and drove through the night (thank you Arai san) to Minami Sanrikucho. Mr. Shimonaka and his son Daiki had gone on ahead of us with half of the supplies in their car. We spent the next three days there with Miura san, along with other volunteers who had come to help. We sorted the supplies that we had brought, along with other stuff that arrived every day by mail, and delivered it to some of the more than 40 locations that Miura san has been supporting regularly. At this point, most of the immediate physical needs of the evacuees still in government sponsored evacuation centers are being covered by the government. Just prior to our trip, the Miyagi prefectural government announced that they were no longer requesting donations of supplies from private individuals, as they already had more than they needed. However, while this may be true in some cities, the situation on the ground in Minami Sanrikucho was a very different story. In most cases, only those who are still living in the evacuation centers are receiving relief aid from the government. Evacuees who want to move into government built temporary housing will in most cases no longer be eligible to receive supplies, meaning they have to buy all of their needs themselves. Because of this, many of the victims are unable to move into temporary housing even if they do win the housing lottery, as their jobs and livelihoods were wiped out in the disaster leaving them unable to support themselves. In Minami Sanrikucho, nearly 90% of the town was destroyed in the tsunami, so there are virtually no shops left to buy basic necessities. With thousands of vehicles destroyed, many of the victims have no way to get out of town to shop, even if they have the needed money. Basic utilities have yet to be reconnected in most areas, and even when the water network is back on, it is estimated it will take months for the water be drinkable, as the water table was polluted by the tsunami. There are also many people in the surrounding villages whose houses were not completely destroyed, but the first floor was ruined, leaving them without cooking or cleaning supplies and basic household goods, and no income. It is to these people that our friend “Sakana no Miura” (literally, Miura the fish man) has been delivering supplies that have been sent to him from concerned individuals all over the country. He has been in the news quite a few times since, and what was once just his personal initiative has grown considerably as more and more people heard about what he was accomplishing. We were put in touch with him through one of our friends in Saitama, and this was the second trip that we made to deliver supplies through Miura San’s network. We will be making another trip from May 31st, and hopefully again from June 6th and June 20th. The vegetables that we brought. This is Enoki Takaaki, who is an actor and a very nice guy. He came to help out for a couple days along with some of his associates.